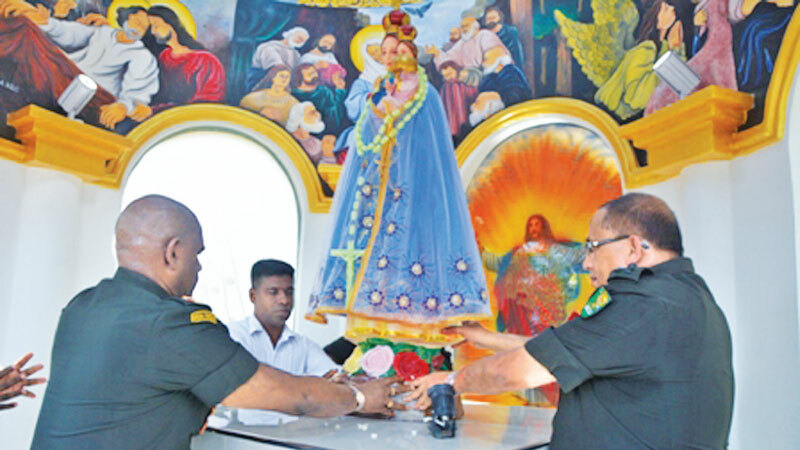 Army Commander Lieutenant General Mahesh Senanayake and Wanni Commander Major General Kumudu Perera pay homage to the statue of Our Lady of Madhu at the Shrine, yesterday. The mass was organised by Security Forces – Wanni to invoke blessings on the Army and the people of the country. The Army Commander attended the Mass at the invitation of Wanni Commander Major General Kumudu Perera. The newly-appointed administrator of the Shrine of Our Lady of Madhu, Rev. Fr. Peppi Sosai was also welcomed on the occasion. The Army Commander also participated in a tree-planting campaign under the theme Ranaviry Haritha Arana, on the concept of the Wanni Commander, during which 45,000 saplings were planted along the Our Lady of Madhu Church suburb. 61 Division General Officer Commanding (GOC) Brigadier K.D.C.G.J. Tilakaratne, together with the 611, 612 and 613 Brigade Commanders coordinated the event with the assistance of Brigade staff and command battalions.